A workshop for parents on understanding the impact of childhood abuse and trauma on parenting, including supportive tools and resources. You thought you were “over it” — those terrible things happened a long time ago. Maybe you’ve been to therapy or maybe enough time has gone by and your past feels long gone. Then you have children and begin reliving your childhood trauma through flashbacks, panic attacks and other post-traumatic stress symptoms. You are not alone in what you are struggling with and healing is possible. 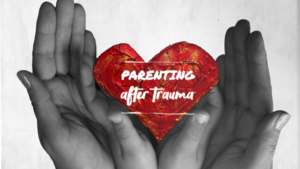 This workshop will focus on understanding the impact of childhood abuse and trauma on parenting, including what steps we can take to heal ourselves while raising our children. We will cover the Adverse Childhood Experiences study and teach about the neuroscience of trauma. You will leave with some simple tools you can use for self-regulation and a list of resources to help you build your circle of support. Joyelle Brandt is a Self-Care Coach for moms. She specializes in working with mothers who are survivors of abuse – helping them develop a personalized self soothing toolkit for stress management. As a speaker, mothering coach, and multi-media creator, Joyelle works to dismantle the stigma that keeps childhood abuse survivors stuck in shame and self-hatred. She is the author/illustrator of Princess Monsters from A to Z and co-editor of Parenting with PTSD, the groundbreaking anthology that breaks the silence about the long-term impact of childhood trauma so that parents can break the cycle of abuse. When she is not busy raising two rambunctious boys, she is most often found playing her guitar or covered in paint at her art desk. You can keep up with Joyelle at www.joyellebrandt.com. Copyright 2018 Breathing Space | All rights reserved.